As your games of croquet advance, heavier equipment will be needed. The Kensington croquet set raises the stakes to the next level. This set blurs the line between backyard croquet and the tournament level game. As a maker of high quality sports equipment, we worked very closely with the manufacturer to ensure the best set possible for this 'transition' set. The Kensington set evolves into more advanced game with full size and full weight mallets & balls. The mallets feature solid ash shafts fitted with heavy dark wood heads. The brass binding adds strength and a touch of class. Black leather bindings with contrasting striping finish the classic look and feel. The 16 ounce Competition balls regulation weight & size (3-5/8"). The hoops are a robust 7/16" diameter steel with a challenging 5-1/2" opening. They are finished in a tough white powdercoating. For players who prefer the 6 wicket game, there are two wickets sporting a red & blue crown. Two solid wood end stakes include clip extensions. Adding a touch of professionalism, ball marking clips and colorful corner flags complete the equipment. An Oakley Woods Quick-Start guide to 9 wicket croquet and a heavy duty carry bag are also included. Taking your game to the next level has never been so easy. 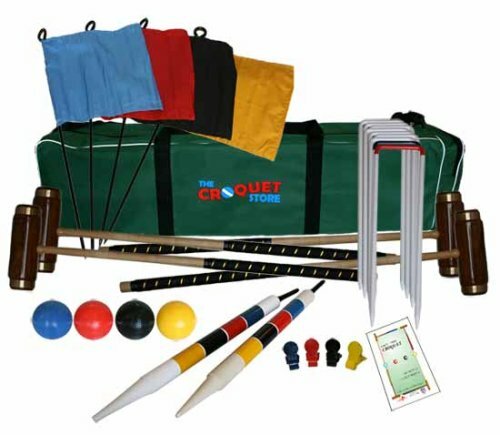 If you have any questions about this product by The Croquet Store, contact us by completing and submitting the form below. If you are looking for a specif part number, please include it with your message.